We acquired our first Register Texas Longhorn Cattle in about 1985 starting with just a handful. Like most people our herd had grown over the years in both size and quality. Our current herd sires include PCC Rim Rock(J.P. Rio Grande X PCC Horizon), Brazos Rose Ranger(M Arrow Wow X Jamakizm's Alphie), Ringman BCB(Working Man Chex X Ringa Dinger),Tuff Stuff(Cowboy Tuff Chex X Field of Pearls),and RJF Rising Star(Tejas Star X WS Sun Rise). Auze shown in the picture above has passed but leaves his mark on the herd. He was a big bull with 85" TTT at less than six years old. He will be missed. 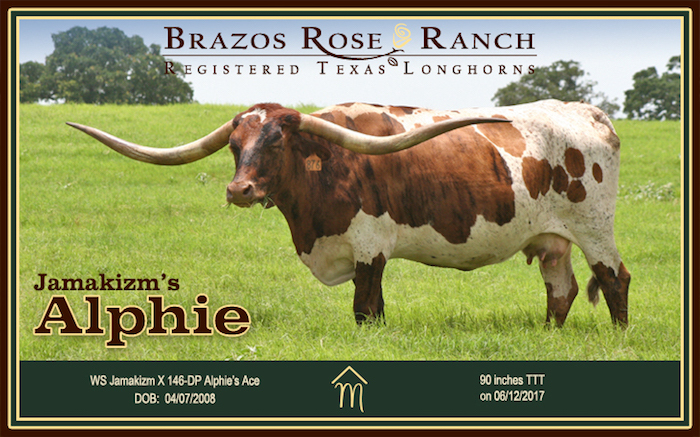 We favor the larger frame longhorn cattle with the traditional Texas Twist. The Brazos Rose Ranch is located in Falls County, Texas just south of Waco along the Brazos River.